Lucy is back with another Pick, looking as adorable as ever. Layering up her basic black with some colourful accents, Lucy is ready for the fluctuating temperatures and rain that have been thrown at us this week. This look pairs two hard working foundation pieces that are key to an effortlessly chic and casual outfit. Lucy loves her Smoke Yoga Jeans for their ability to go with absolutely everything in her wardrobe and magically make you feel like you are wearing sweat pants. Topped with a Black C'est Moi Turtleneck that begs to be layered and accessorized, this piece is not your Grandma's turtleneck. 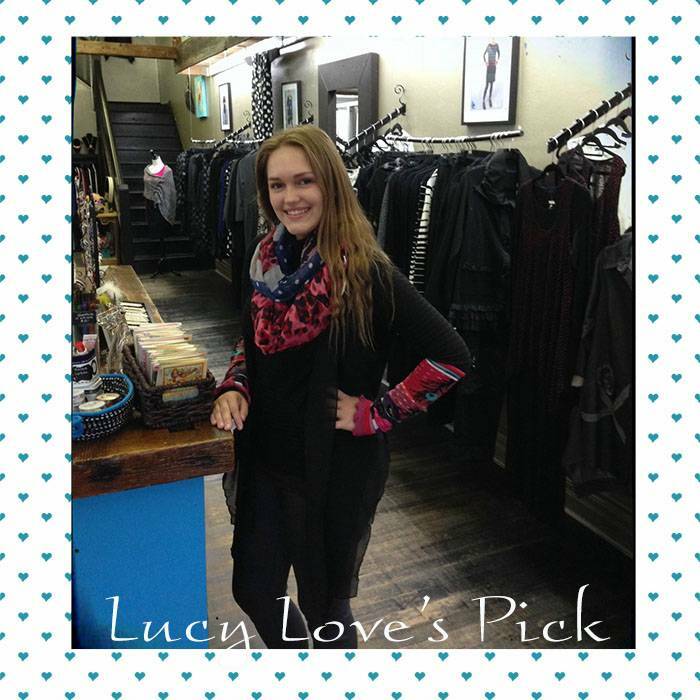 Swinging by our scarf wall to punctuate this all black palate with a hint of colour, Lucy has selected a Lousje & Bean Signature Infinity Scarf that really pops. The last addition to this look is this set of Dub n Drino Sleeves that bring a youthful energy to classic black. Lucy's style is timeless with a hint of edge and is a great example of how the simplest accessories can change the entire mood of a basic black foundation.